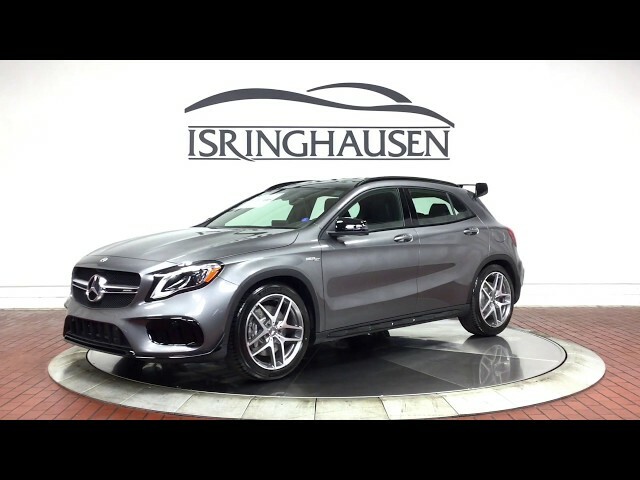 This stunning 2019 Mercedes-Benz GLA 45 AMG in Mountain Grey Metallic comes with factory options including AMG Aerodynamics Package, AMG Night Package, AMG Performance Exhaust System, Panorama Roof, Smartphone Integration, Harman/Kardon Sound System and much more. The AMG GLA 45's Track-tuned, torque-vectoring AMG Performance 4MATIC outsmarts ordinary all-wheel drive while the 375 handcrafted horses power it through every straight and corner it is faced with. Contact a Mercedes-Benz sales specialist today by calling 877-362-9715. Isringhausen Imports is Central Illinois' premier new car, used car and certified pre-owned (CPO) dealership for quality Mercedes-Benz vehicles. At Isringhausen Imports, we have become a leader in the industry by working each day towards the greater good of our customers, our fellow employees, and our community.